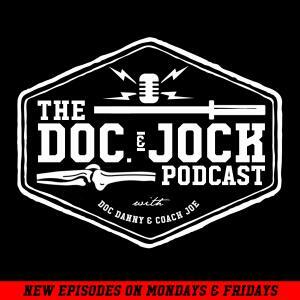 On Episode 132 of the Doc and Jock Podcast we sit down with Tommy Moffitt, who is the director of strength & conditioning at LSU. Read through Coach Moffitt's bio and you will notice has not only been a part of multiple national championships but also been named Strength and Conditioning Coach of the year multiple times by multiple organizations. In this episode we discuss the application of concentric, isometric and eccentric muscular contraction, the use of olympic weightlifting in preparation for sport specific demands, and motivating the division one athlete. Coach Moffitt also provides a reading list that any Strength and Conditioning Coach can appreciate.